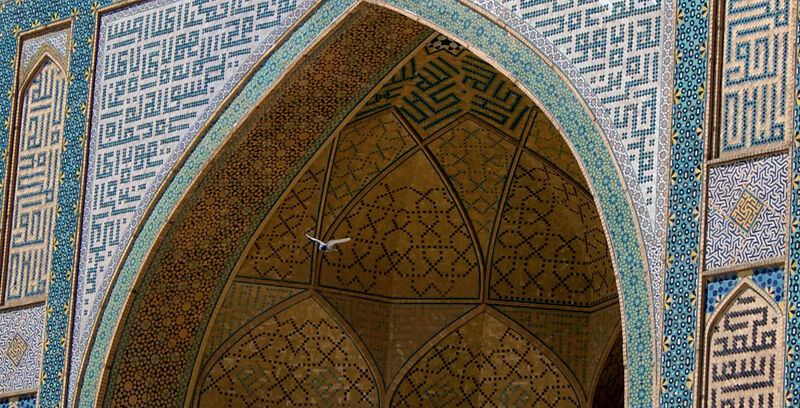 Of all the mosques in Isfahan I liked the Jameh Mosque the most mainly because it was the most authentic. 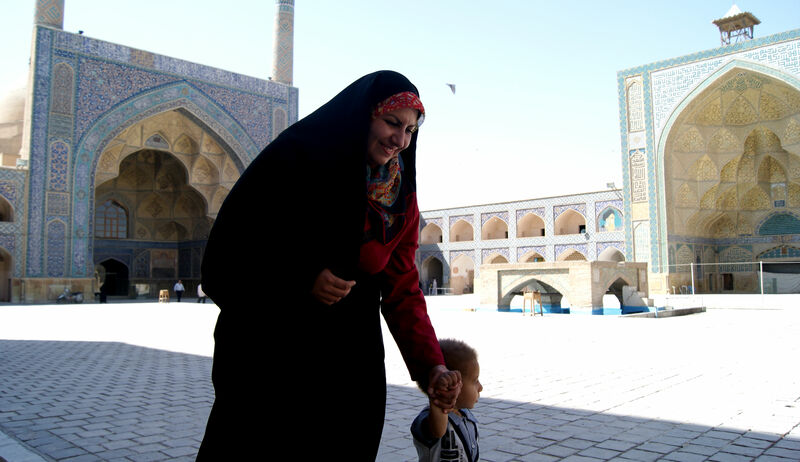 If you wander north west from the Naqsh-e Jahan Square through the bazaar and ask shopkeepers for directions as you go you will find this UNESCO World Heritage Site. 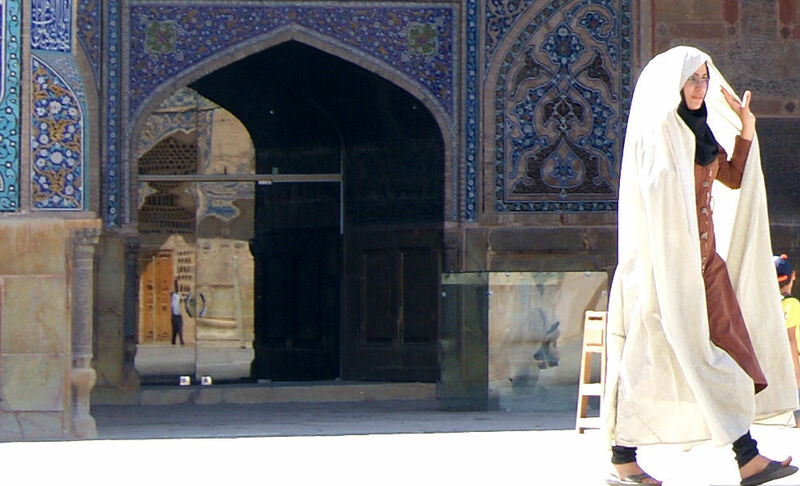 The entrance to the mosque is small and doesnt look much different than other portals in Isfahan so if in doubt as the merchants. It could be that this mosque is free to visit as we never saw anywhere to buy a ticket. 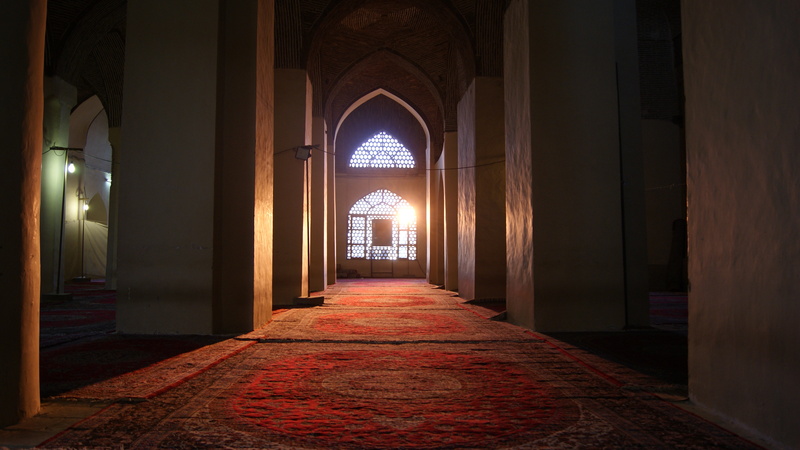 The first thing that strikes you is how quiet the mosque is. No tourists here that’s why it feels less Disneyland. 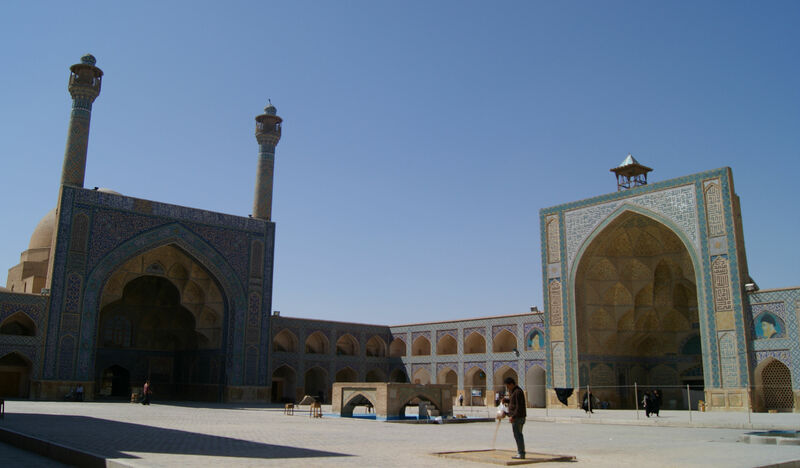 The Jameh Mosque is very old, almost a thousand years older than most of the buildings surrounding Naqsh-e Jahan Square. 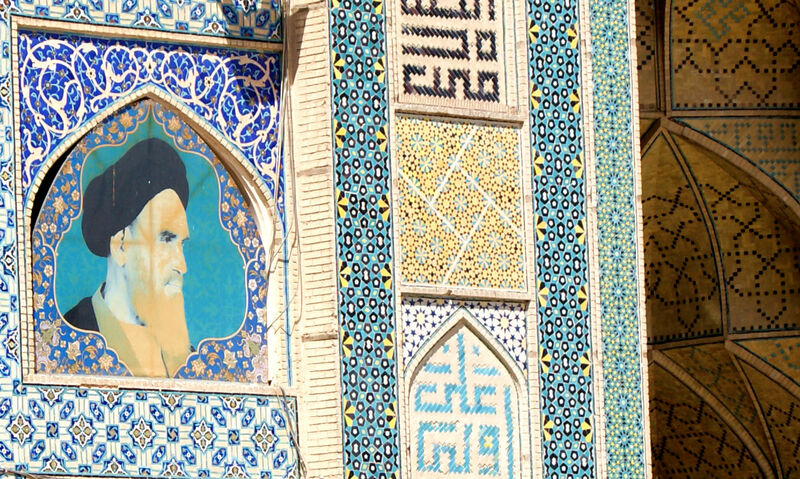 Another interesting thing was the mosaic of the Ayatollah Khomeini on one of the iwans. I thought that images of living things were not allowed inside mosques. Anyway the Jameh Mosque is a lovely place to visit and just to sit in the shade and watch people coming and going. Every now and then a man in a white wooly jumper and small green wooly hat would rush over and lead us down parts of the mosque to show us the exquisite mihrab or the dome. I felt very much welcomed here, we were allowed to go into the prayer section and nosey around alone and didn’t get the feeling that we were interrupting people. 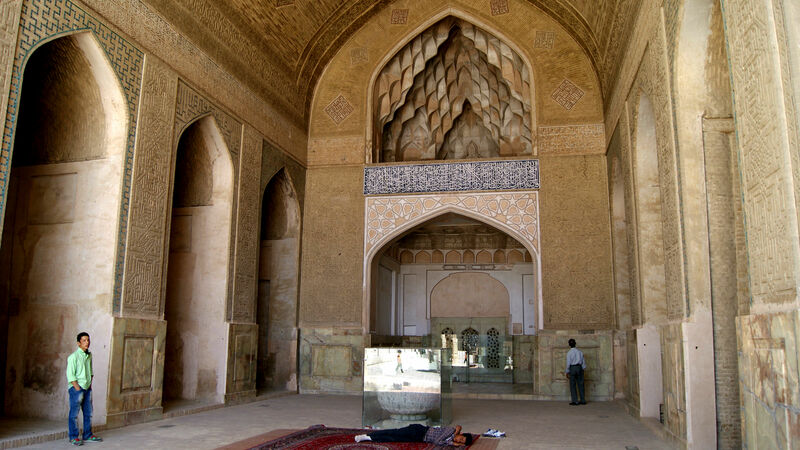 If you love history and architecture and want to connect to a more real Iran then the Jameh Mosque is definetly worth a visit! 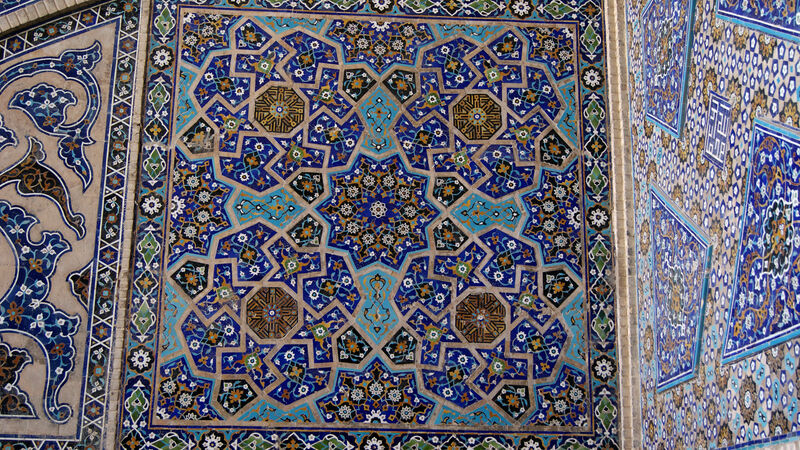 This entry was posted in Iran and tagged Jameh Mosque of Isfahan, Masjid-e-Jāmeh Isfahān, Mongols, Mosaic of Ayatollah Khomeini, Muzzafarids, Safavids, Seljuk prayer hall, Timurids, مسجد جامع اصفهان. Bookmark the permalink. ← The Abbasi, Iran´s most famous hotel. Hi Grace. 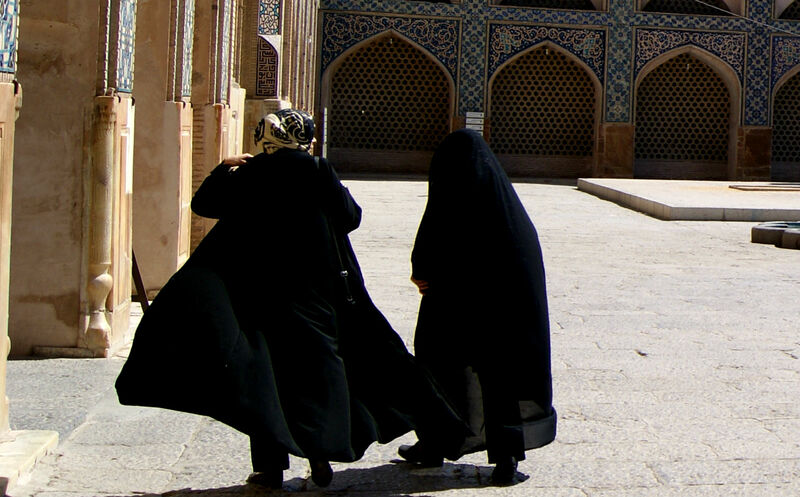 Iran is a country I’ve been dreaming of visiting. 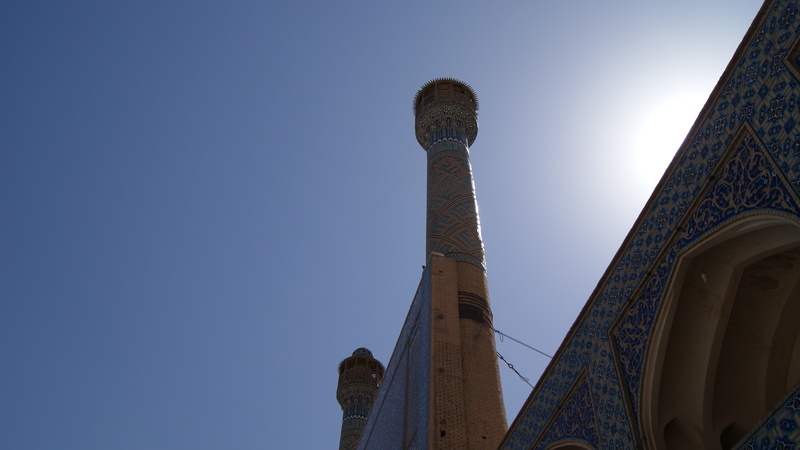 Isfahan, Persepolis, and all the ancient mosques always fascinate me. Just now I read an article about how Iran is quickly becoming popular among Western tourists, following the recent diplomatic thaw between Iran and the West. Then I found your blog which provides me with a very interesting perspective on how the country was like during your trip. 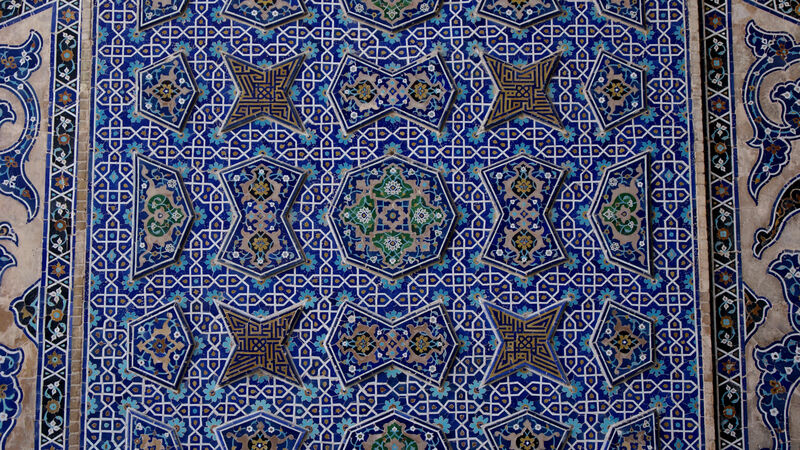 I really am seriously thinking of going to Iran sooner than later. Thanks! Speaking of timewrap that makes me think of Myanmar. I went there for the first time in early 2012 and Yangon was like a city trapped in time! I went back in late October this year only to learn that so many things had changed, just within three-year’s time! That’s why I really should start planning of going to Iran.